The story of the Canadian dollar begins in the currency chaos of the early French and British colonial period in North America. Through the seventeenth century and until well into the nineteenth, various coins from many countries circulated freely in the colonies. 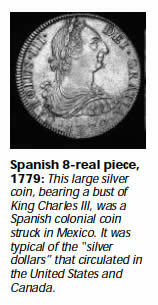 These included not only English and French coins, but also coins from Portugal, Spain, and the Spanish colonies in Latin America—notably Mexico, Peru, and Colombia. The hazards of sea travel and persistent trade imbalances with the home country left the colonies chronically short of coins. In an effort to attract fresh supplies, French and British colonial authorities typically gave higher values to coins circulating in their jurisdiction than to the same coins circulating in England and France. For example, in New France, coins under the monnoye du pays system during the late seventeenth century were given a value one-third higher than monnoye de france. Similarly, British colonies in North America valued the silver Spanish dollar at rates of up to 8 shillings, despite the passage of legislation by the British government (Act for Ascertaining the Rates of Foreign Coins in Her Majesty's Plantations in America) in 1707 that valued the coin at 4 shillings and 6 pence.The chronic coin shortage also encouraged the introduction of paper money. The most famous issue is undoubtedly the card money of New France. Introduced in 1685, card money initially consisted of playing cards cut to different sizes according to denomination and signed by colonial officials. 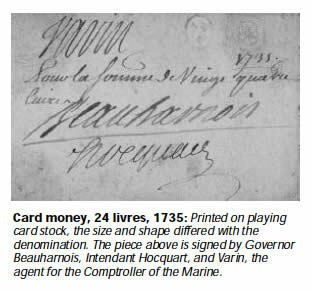 Despite the protests of authorities in Paris, who objected to the loss of budgetary control, there were several issues of card money before it was withdrawn from circulation in 1719. Card money reappeared in 1729, however, and remained readily accepted until rising inflation, associated with the financing of the Seven Years' War during the 1750s, undermined confidence in its value. To add to the confusion, different colonies rated coins differently. Sometimes, certain coins were deliberately overrated (i.e., overvalued) or underrated (undervalued) relative to others, given their weight in gold or silver, in order to encourage or discourage their use. In such circumstances, overrated coins drove underrated coins from circulation—an application of Gresham's Law, "bad money drives out good." Underrated coins were typically hoarded or shipped to colonies that valued them more highly. To counteract this, colonial legislatures periodically revised their ratings. Ratings were also revised in response to other factors, including the decline in the value of silver relative to gold throughout the eighteenth and nineteenth centuries and the gradual wearing of old coins (which lowered their weight and reduced their intrinsic value). 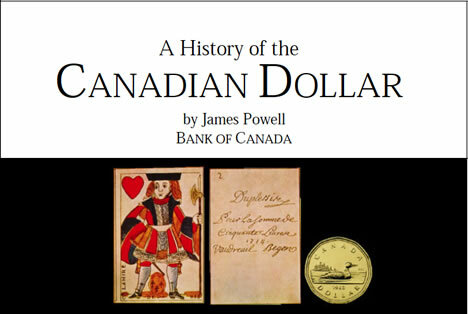 To read the full 'A History of the Canadian Dollar' please Login or Register. Dollars and cents or pounds, shillings, and pence? To read the full 'History of the Canadian Dollar' please Login or Register.